Designed specifically for use on production lines where many fasteners are to be tightened to the same torque. For handle extension, order Extension Adapter P/N 853538 and custom length extension. Accuracy of +/- 4% meets or exceeds ASME B107.14M and ISO 6789, offering consistent assembly quality. Wrench can be calibrated using any unit of torque measure. Ball bearing rockover assembly assures smooth operation, enhances repeatability, increases cycle life of wrench, and helps control ownership costs. Excellent audible and tactile impulse when preset torque is achieved. Can be ordered preset from the factory or torque tester can be used to set torque value. Adjustments to torque settings can only be made with a Combination Adjusting and Release. 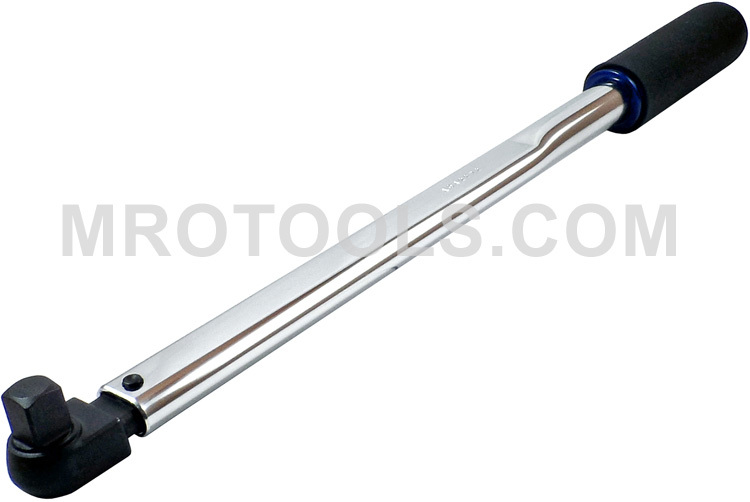 The 810174 Sturtevant Richmont Preset Fixed Square Drive LTCS Series Torque Wrench is one of thousands of quality tooling products available from MRO Tools. Please browse Sturtevant Richmont Preset Fixed Square Drive LTCS Series Hand Torque Wrenches for tools similar to the 810174 Sturtevant Richmont Preset Fixed Square Drive LTCS Series Torque Wrench. 810174 Sturtevant Richmont Preset Fixed Square Drive LTCS Series Torque Wrench description summary: Model: LTCS 1800I Torque Capacity: 360 in./lbs.-1800 in./lbs. / 40.8 Nm-204 Nm Square Drive: 1/2'' Weight(lbs.)/Length(in. ): 1.5/16.9'' Quantity discounts may be available for the 810174 Sturtevant Richmont Preset Fixed Square Drive LTCS Series Torque Wrench. Please contact MRO Tools for details.